Infectious myositis is an acute, subacute, or chronic infection of skeletal muscle. Once considered a tropical disease, it is now seen in temperate climates as well, particularly with the emergence of HIV infection. [1, 2] In addition to HIV, other viruses, bacteria (including mycobacteria), fungi, and parasites can cause myositis. For a detailed discussion of HIV-associated myopathies, refer to HIV-1 Associated Myopathies. Single or multiple muscle groups in the limbs can be involved, a notable exception being trichinosis, which commonly involves orbital muscles. In most instances, involvement of proximal muscles is predominant. Characteristic myopathic features and findings of polymyositis, including inflammatory infiltrates, may be seen. Viruses: Viruses implicated in the pathogenesis of myositis include HIV-1, human T lymphotrophic virus 1 (HTLV-1), influenza, coxsackieviruses, and echoviruses. As in the non–HIV-infected population, HIV-associated polymyositis is most likely autoimmune in origin. Influenza myositis could be due to direct viral invasion or autoimmune response. Pyomyositis: The pathogenesis is unclear, but trauma, viral infection, and malnutrition have been implicated. Although most cases of pyomyositis occur in healthy individuals, other pathogenetic factors include nutritional deficiency and associated parasitic infection in tropical climates. In the temperate climates, pyomyositis is seen most commonly in patients with diabetes, HIV infection, and malignancy. Ixodes scapularis (dammini), tick vector for Lyme disease. Courtesy of Centers for Disease Control and Prevention. 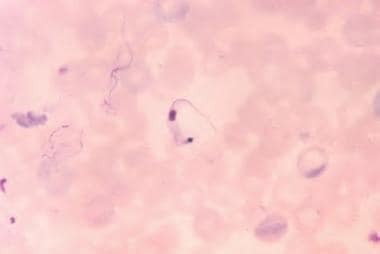 American trypanosomiasis: The causative organism is a protozoan, Trypanosoma cruzi. The insect vectors are reduviid bugs such as Rhodnius prolixus ("vinchuca"), Triatoma infestans, and Panstrongylus megistus. The insect defecates on the host's skin as it feeds, contaminating the bite wound with feces containing the parasites. T cruzi occurs in 2 forms in humans, the intracellular amastigote and the trypomastigote form in blood, which is ingested by the insects (see image below). The parasite reproduces asexually and migrates to the hindgut. In humans, the parasite loses its flagellum and transforms into the amastigote form, which may enter muscle and multiply, resulting in myositis. Trypanosoma cruzi in blood smear. Courtesy of Centers for Disease Control and Prevention. Cysticercosis: Myositis also can occur in cysticercosis, which represents an infection by the larval stage of the intestinal tapeworm Taenia solium. Human infection results from ingestion of raw or incompletely cooked pork. Another mode of infection is by contamination of food and water by feces containing the eggs of the tapeworm. The larvae migrate throughout the body and may form fluid-filled cysts in a variety of tissues, including muscle. Pyomyositis: Approximately 676 cases have been reported in the US literature since 1971. 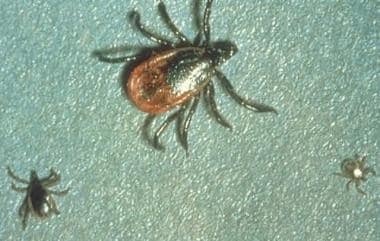 Lyme disease: Endemic areas include the Northeast, mainly Connecticut, Massachusetts, Maryland, and New York; the North-Central region, mainly Wisconsin and Minnesota; and the West Coast, especially Northern California. In eastern Uganda, 400-900 cases of tropical myositis occur per year; it is rare in western Kenya. Cysticercosis is most prevalent in India, Eastern Europe, Central America, and Mexico. In endemic areas of Latin America, 8% of the population is seropositive for American trypanosomiasis. A potentially life-threatening complication of pyomyositis is toxic shock syndrome. Rhabdomyolysis can complicate influenza and, rarely, coxsackievirus myositis. In Hawaii, muscle abscesses were noted to be confined to the Polynesians. In the French Pacific islands, the disease is not seen in the French settlers. Infectious myositis has a male predominance and is typically seen in young adults. O'Neill DS, Baquis G, Moral L. Infectious myositis. A tropical disease steals out of its zone. Postgrad Med. 1996 Aug. 100(2):193-4, 199-200. [Medline]. Crum NF. Bacterial pyomyositis in the United States. Am J Med. 2004 Sep 15. 117(6):420-8. [Medline]. Reimers CD, de Koning J, Neubert U, et al. Borrelia burgdorferi myositis: report of eight patients. J Neurol. 1993 May. 240(5):278-83. [Medline]. Costa RM, Dumitrascu OM, Gordon LK. Orbital myositis: diagnosis and management. Curr Allergy Asthma Rep. 2009 Jul. 9(4):316-23. [Medline]. Buss BF, Shinde VM, Safranek TJ, Uyeki TM. Pediatric influenza-associated myositis - Nebraska, 2001-2007. Influenza Other Respir Viruses. 2009 Nov. 3 (6):277-85. [Medline]. Rubín E, De la Rubia L, Pascual A, Domínguez J, Flores C. Benign acute myositis associated with H1N1 influenza A virus infection. Eur J Pediatr. 2010 Sep. 169 (9):1159-61. [Medline]. Wong SL, Anthony EY, Shetty AK. Pyomyositis due to Streptococcus pneumoniae. Am J Emerg Med. 2009 Jun. 27(5):633.e1-3. [Medline]. Watts MR, Chan RC, Cheong EY, et al. Anncaliia algerae microsporidial myositis. Emerg Infect Dis. 2014 Feb. 20(2):185-91. [Medline]. [Full Text]. Trusen A, Beissert M, Schultz G, et al. Ultrasound and MRI features of pyomyositis in children. Eur Radiol. 2003 May. 13(5):1050-5. [Medline]. Simpson DM, Citak KA, Godfrey E, et al. Myopathies associated with human immunodeficiency virus and zidovudine: can their effects be distinguished?. Neurology. 1993 May. 43(5):971-6. [Medline]. Ayala E, Kagawa FT, Wehner JH, Tam J, Upadhyay D. Rhabdomyolysis associated with 2009 influenza A(H1N1). JAMA. 2009 Nov 4. 302 (17):1863-4. [Medline]. Belman AL, Preston T, Milazzo M. Human immunodeficiency virus and acquired immunodeficiency syndrome. In: Goetz, Pappert, eds. Textbook of Clinical Neurology. 1999:898-900. Crum-Cianflone NF. Bacterial, fungal, parasitic, and viral myositis. Clin Microbiol Rev. 2008 Jul. 21(3):473-94. [Medline]. [Full Text]. Crum-Cianflone NF. Nonbacterial myositis. Curr Infect Dis Rep. 2010 Sep. 12(5):374-82. [Medline]. [Full Text]. Hays AP, Gamboa ET. Acute viral myositis. Engel, Franzini-Armstrong, eds. Myology: Basic and Clinical. 2nd ed. 1994. 1399-409. Kim JY, Park YH, Choi KH, et al. MRI of tuberculous pyomyositis. J Comput Assist Tomogr. 1999 May-Jun. 23(3):454-7. [Medline]. Patel SR, Olenginski TP, Perruquet JL, Harrington TM. Pyomyositis: clinical features and predisposing conditions. J Rheumatol. 1997 Sep. 24(9):1734-8. [Medline]. Tulio AM et al. Strickland TG. American trypanosomiasis. 7th ed. Hunter's Tropical Medicine; 1991. 628-37. A patient with trichinosis and ocular involvement. Courtesy of Centers for Disease Control and Prevention and Dr. Thomas F. Sellers, Jr.
Histopathology: Borrelia burgdorferi spirochetes in Lyme disease, with Dieterle silver stain. Courtesy of Centers for Disease Control and Prevention and Dr Edwin P. Ewing, Jr.